The flat Cambridgeshire fenlands might lack even the most modest of hills, but they nonetheless provide an interesting place to test a new car. If you’re looking for cracked, patched and crumbling asphalt, sharp off-camber bends, long arrow straights and staccato transverse ridges – plus the odd juddering level crossing – you’ll find them all on the narrow roads that criss-cross the peaty farmlands. Chevrolet’s Volt coped admirably with these diverse surfaces, made all the more challenging by a torrential spring downpour. Long, gentle undulations left the car feeling a little floaty at high speed, and the wheel gave very few clues about diminishing grip before dogged understeer set in, but if you’re interested in comfort rather than cornering, the Volt is a welcoming place to sit and steer. The seats, in particular, are superbly snug and supportive. There are just four chairs all told, giving a coupe-like ambience despite the sensible five-door layout. This feeling is reinforced as you thump your head on the low roof climbing into the back. 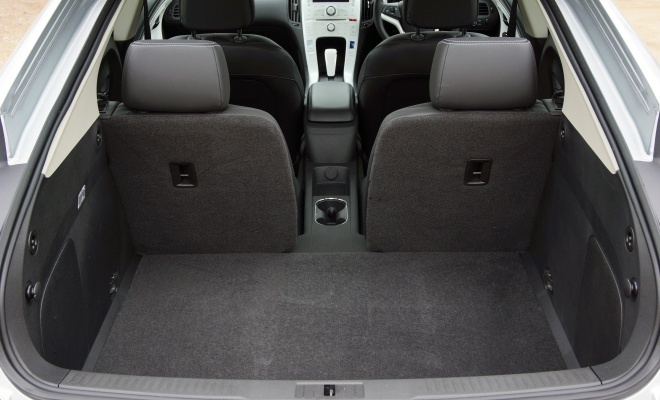 The rear seats are set unusually wide apart, with a yawning void leading straight through to the luggage compartment. Brake sharply on your way home from the supermarket and your groceries might rocket forward to join you up front. I expect Chevrolet will sell some sort of net to plug the gap. This odd arrangement is a direct result of the Volt’s pioneering petrol-electric powerplant. The wide centre tunnel helps to house a T-shaped stack of lithium ion batteries that, when fully topped up with 16kWh of energy, can propel the Volt for 25 to 50 miles unaided, depending on speed. Beyond that range, the 1.4-litre petrol engine under the bonnet takes over, running the Volt until the next time the car is plugged into a mains socket. A full recharge takes about four hours. Famously, the engine rarely connects to the driven front wheels, instead spending its time humbly turning a generator to create electrical power, which is fed to the 110kW (150bhp) electric drive motor as required. In contrast with a hybrid like Toyota’s Prius, which blends petrol and electric power depending on demand, the Volt is an electric car with petrol power as backup. That means the engine lies dormant at any speed as long as there is battery power available. But once the battery is depleted, the engine fires up promptly and keeps running as long as you keep moving. The driver can influence this all-or-nothing behaviour to a degree. 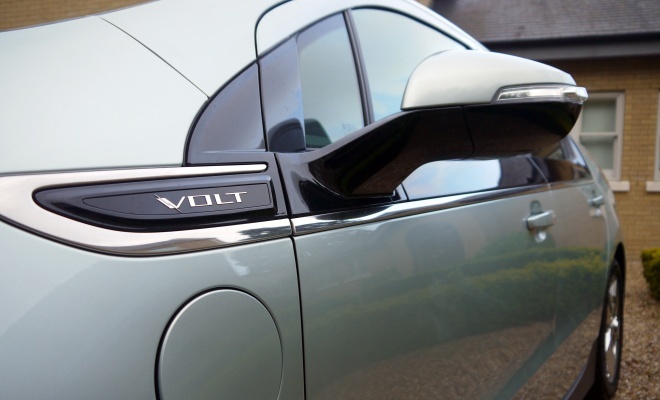 European Volts include a “Hold” mode, which the driver can call up via a centre-console button. Once selected, the engine will start immediately, saving battery reserves for a later part of the journey. Similarly, in “Mountain” mode, the engine will top up a very flat battery or keep a proportion of electrical power in reserve, in anticipation of steep slopes to come where full beans might be needed. The mountains in mind are the Rockies or Alps, however. Don’t imagine you’ll need Mountain mode to scale Highgate Hill. The remaining mode – other than “Normal” – is “Sport”, which noticeably quickens the car’s response to the throttle but doesn’t actually make it any faster. In addition to these four primary modes, the transmission lever also offers two forward options – either D or L. The L position produces more noticeable drag as you lift the throttle, grabbing more of the car’s momentum and squirreling it away as energy in the battery through regenerative braking. It’s ideal for descending steep hills, and you can also happily drive around town in L mode as well. The stronger braking effect takes a little adjustment, but I’m told it can bring a measurable benefit in efficiency. 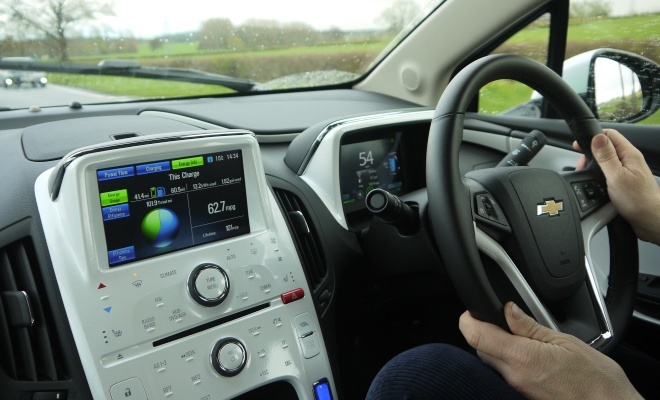 The Volt makes a very relaxed and refined motorway cruiser, even if its top speed is electronically capped at a relatively modest 99mph. At ordinary motorway speeds it will overtake with ease, although in petrol-powered, extended-range mode there is a noticeable lag between toe and go. You floor the accelerator, the engine revs jump up to generate more juice, and only then do you surge forward. On batteries alone, the lag is entirely absent. Those moments when you ask for brisk acceleration under petrol power are the only times when the Volt is anything other than extremely quiet. At steady speeds, or on slow urban roads, it’s not easy to tell whether the engine is running or not. 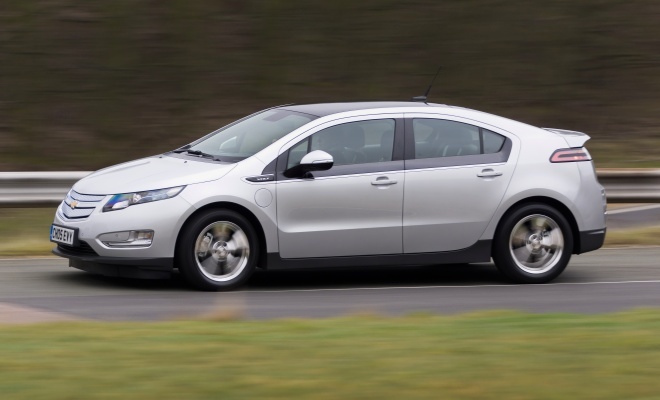 The Volt is reasonably quick at getaways, helped by the low-speed, high-torque characteristics of electric motors. The surge to 62mph takes only nine seconds, which is quick for a 1.7-tonne car with 150bhp. The car’s driving sensations are familiar – it’s only a few weeks since I spent a day with the Volt’s virtual doppelganger, the Vauxhall Ampera, and the two are extraordinarily similar. That’s really no surprise, given that all Volts and Amperas come off the same Detroit production line. The Ampera is a little more firmly suspended, but the difference is marginal. The Volt is not soggy and the Ampera isn’t brittle – they provide two flavours of the same reliable recipe. 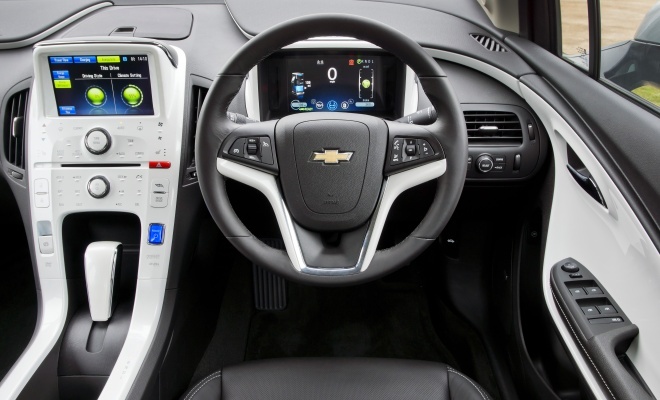 The Vauxhall and Volt are much the same inside as well, although the Chevy is a little more eye-catching due to the crisp white finish applied to the centre console. The Ampera’s central stack is a more sober gunmetal grey, by contrast. Most of the minor controls are touch sensitive, and the inspiration provided by a popular fruit-flavoured maker of consumer electronics is all the more obvious given the clean white finish. But the design isn’t up to Apple grade, sadly, with the arrangement of items across the console feeling a little haphazard. Similarly, the graphical displays that fill the twin information screens are a little too beautiful for their own good. There’s a difference between an engaging device like an iPad, to which you give your full attention, and an instrument panel, which is lucky to get a momentary glance. Chevrolet’s designers don’t seem to have grasped this important distinction. I recently spent a fortnight running a Nissan Leaf, which provides a much clearer set of instruments for keeping the driver up to date. While the Leaf’s 100-mile range meant I could go several days without needing a charge, I also had to leave it at home when I drove to visit relatives 150 miles away. The Volt, by contrast, is designed to cope with both local pottering and longer trips. For me, the Volt’s limited electric autonomy would easily meet my day-to-day needs, and the petrol fallback would support my frequent longer jaunts. The drawback to this flexibility is a problematic price. The Volt is on sale now at £29,995, after a £5,000 contribution from the government’s plug-in grant, which adds up to quite a lot of money. That’s £4,000 more than the Leaf, a pot of cash that would cover quite a few hire cars. Looked at through the lens of its Vauxhall sibling, however, the Volt is a bit of a bargain. The Volt is sold in only one trim level, which happens to be virtually identical to the Ampera in its Positiv specification, which costs £2,255 more at £32,250. I know which of the two cars I’d rather buy. Plump for the golden cross over the Vauxhall griffin and you’ll find that Chevrolet dealers are still rare beasts in the UK, however. Only two are equipped to grapple with the Volt and its unusual electrical powertrain – one in Wimbledon and the other in Cambridge. But if you have a hankering for a Volt, don’t let the paucity of dealers put you off. I’m told that the 24 Vauxhall dealers geared up to tinker with Amperas can also service a Volt without voiding the eight-year drivetrain warranty. 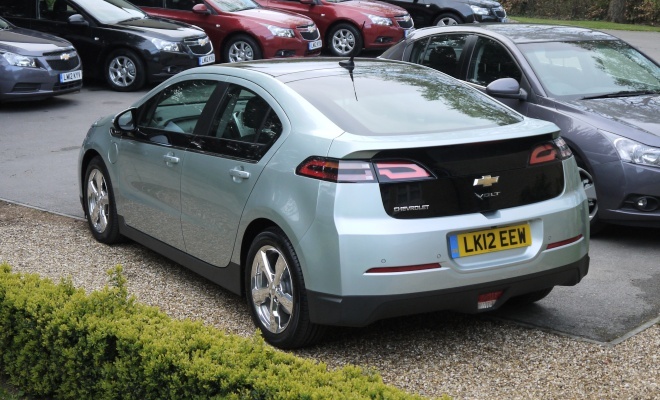 Don’t take my word for it – owners should get clarity from Chevrolet, in writing, before doing anything that might jeopardise their cover – but the prospect makes Volt ownership a more widespread proposition in the UK. As the first mainstream extended-range electric car, the Volt embodies an entirely new kind of vehicle. 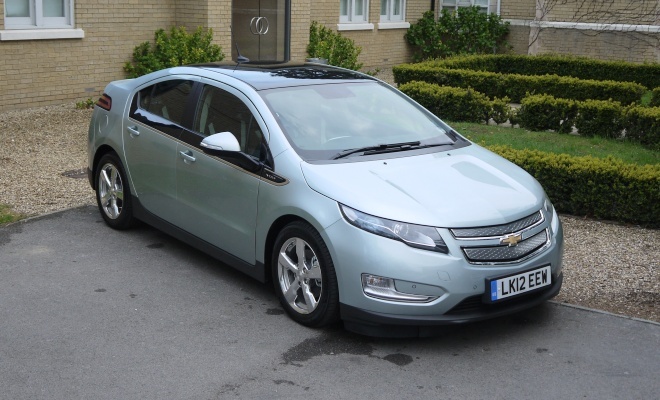 Despite this pioneering role, the Volt feels poised, polished, grown up and convincing. Yes, it’s expensive, but Chevrolet has done its best to wrap a premium feel around the pricy powertrain that accounts for much of the cost. If you’re drawn to electric motoring but have an unpredictable lifestyle with awkwardly distant friends and relations, the Volt might just be the car you’ve been waiting for.